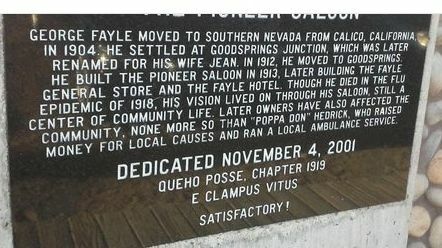 Born and raised in Los Angeles, George Arthur Fayle rejected big city life in favor of barren desert lands in Southwestern Nevada where he helped found two towns and a saloon that he appropriately named “Pioneer.” Since Fayle’s untimely death in 1918 his establishment has become famous as the oldest working saloon in Nevada. Fayle’s parents had come to California from afar. According to the 1880 census, his father, also George, was born in Ireland, likely County Mullingar, and his mother, Clara, hailed from Maine. Born in February 1881 George was the couple’s first child, born when his father, a clerk, was 28 years old and his mother, 22. He spent his early years in Los Angeles and was educated in its schools. When he was just 20 years old Fayle married Jean Henderson, a step that marked a sharp change in his life. With Jean he headed out of the big city for a small isolated California mining town located in the Calico Mountains of the Mojave Desert. There he found work hauling ore from the silver strikes. What Jean thought of this change has gone unrecorded, described as a mate who, “…Through the years of married life [was] a devoted and helpful wife, sharing in his struggles and cheering him through the dark places.” The couple’s first son, George Junior, was born in Calico. In 1904 family fortunes changed. 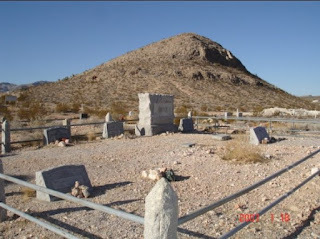 George’s uncle, Samuel Yount asked Fayle to come to work with him in a small settlement in the Nevada desert called Goodsprings Junction. “…Who would, of choice, want to live there?” queried one puzzled writer. Fayle saw an opportunity, however, and moved his wife and newborn to Nevada. Shown above, except for the railroad station, Goodsprings Junction came to be owned by the firm of Yount & Fayle, including a hotel and boarding house, general store, feed stables and camp yard. Fayle became postmaster and renamed the place “Jean” after his wife. Yount & Fayle became a highly profitable enterprise. 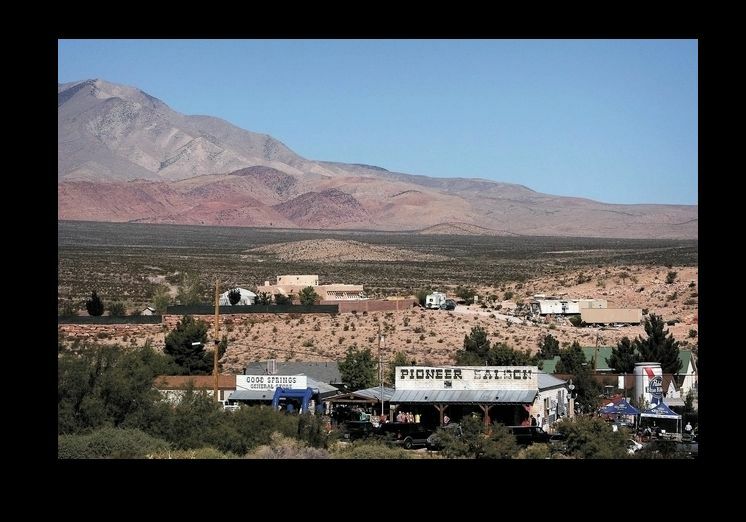 Eight miles across a mountain range was the town of Goodsprings, Nevada, shown left. It was the home of the Yellow Pine mine that was producing prodigious amounts of zinc and lead ores. Yount was a major stockholder and secretary of the mine. Seventy tons of ore were shipped daily via a specially built railway from Goodsprings and off-loaded at Jean. From there it was distributed to smelting facilities across the West via the San Pedro, Los Angeles and Salt Lake Railroad. The Salt Lake Mining Review of March 1912 described George Fayle, calling him “…One of those pushing, energetic, and affable California boys whom it is always a pleasure to meet….and a rising man.” Unfortunately no photo of Fayle is available from Nevada historical sources but we have a description from his draft registration for World War One. He was described as of medium height, “stout,” gray eyes, blonde hair and at 36 years old growing bald. In 1912, Fayle moved his family, now including a second son, Leonard Ray, and a daughter, Jean Nevada, across the mountains to Goodsprings. 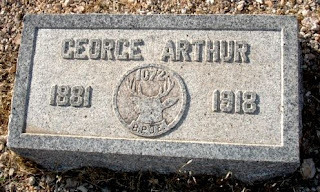 With financial help from Yount, who already owned a general store there, George already had established a tent store for miners and begun an ore hauling business. He then became a partner in Yount’s store. 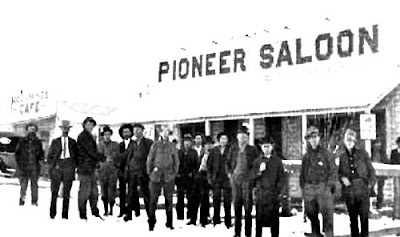 Upon relocating in Goodsprings, Fayle built a saloon. Not the usual ramshackle building, this watering hole featured interior and exterior walls of stamped tin plates manufactured by Sears Roebuck. The bar was similarly impressive, crafted by the Brunswick Company of Maine in the 1860s, featuring a large mirror and a brass footrail. It was shipped from Rhyolite, Nevada, from a defunct saloon in a soon-to-be “ghost town.” Fayle called his establishment the “Pioneer Saloon,” shown right flanked by a crowd of his clientele. He began shipping in whiskey by the barrel, decanting it into ceramic jugs, like the one shown here, and selling it to retail customers. Note that the jug bears the year 1915. Running the saloon, however, was not without incident. In July 1915, during a poker game at the Pioneer, a miner named Paul Coski was caught cheating. When the dealer, Joe Armstrong, ordered him to leave, Coski refused and the dealer pulled a gun. The two men scuffled. Armstrong fired, hitting Coski several times and killing him. Errant bullets pierced the tin walls of the Pioneer where the holes are still visible. The coroner ruled Coski’s death as justifiable homicide. One did not cheat at cards at the Pioneer Saloon. 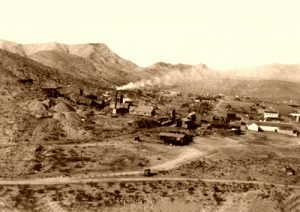 Meanwhile, with ore increasingly plentiful, Goodsprings was growing, reaching a population of about 1,000 in 1915 — larger than Las Vegas. The following year Fayle built a hotel, shown here. It was among the most luxurious in Nevada, providing 20 guest rooms, electric lights, hot and cold running water, steam heat, and a restaurant that claimed fine dining. Advertised as the “finest hotel in the west,” the Fayle Hotel opened with a grand ball on May 13, 1916. The hotel and restaurant initially were so successful that Las Vegas residents made the forty mile trip south to Goodsprings. According to at least one historian, Fayle’s hotel not only served such clientele, but also provided a place where the “soiled angels” of the West could meet with their miner and prospector customers. Tragically, in 1918 Fayle fell victim to the Spanish Flu epidemic that was sweeping the U.S. Contracting the disease in December for several days he seemed to be recovering but then developed pneumonia and no medical response was effective. His funeral services were held in the dining room of the Fayle Hotel, the ritual being that of the Fraternal Order of Elks, of which he had been a member, as indicated on his gravestone. The 37-year-old asked that he be buried in Goodsprings at the local desert cemetery at a spot that looked out on the mountain and the valley. A photo of the cemetery shows the Fayle plot at left marked by the largest monument. Jean Fayle, recognized as a pioneering figure in her own right, stepped in to manage the family’s business interests. 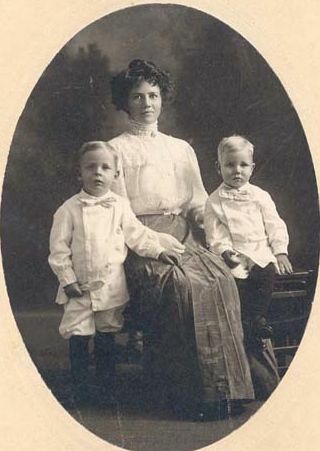 Shown here with sons, George, left, and Leonard, she indicated that she would continue in that role until the boys had completed their education and were able to assume running the businesses. With the passage of time the Fayles sold the Pioneer Saloon that continued to operate, with time out for National Prohibition, even as Goodsprings after World War One saw mining profits slump and the population plummet to fewer than 100 residents. Jean died in 1950 and was buried next to her husband in Greenspring. 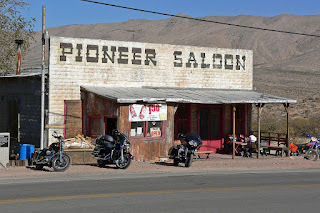 Today the Pioneer Saloon is a tourist stop, seven miles off Interstate 15, a highway that stretches north-south across the entire Western United States. 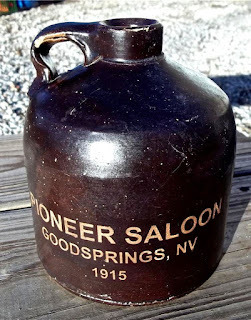 A stop in Goodsprings yields the story of the 1915 shooting and other incidents occurring there over the generations. 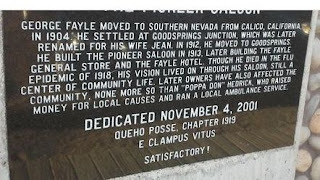 A historical marker tells briefly of the contribution of George Fayle, who for a time was instrumental to making a town bloom in the Nevada desert. Note: Several references were particularly helpful in researching this post. They include: The Pioneer Saloon website; The Salt Lake Mining Review of March 1912; Legends of America website: “Goodsprings Nevada — Still Kicking in the Desert Dust”; and George Fayle’s obituary in the Las Vegas Age of December 14, 1918. 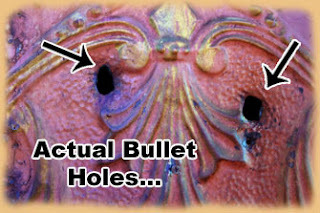 Addendum: This post marks the 200th and 201st “followers” that this blog has attracted. My thanks and appreciation go out to each one of these individuals. They provide me with inspiration. Great Grandson: As far as I can tell the saloon is still open. You can get online and perhaps confirm. I would love to get there myself and muse on your energetic ancestor. If you have any photo of George I would be delighted to have it and add to the profile, giving you credit, of course. Keeping Up with the Joneses in Liberty, Mo.